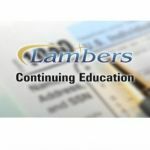 Specific Types of Representation – Lambers, Inc. This 1 Credit Hour Course covers the IRS Collection Process, Offer in Compromise, Federal Tax Liens and Levies, Trust Fund Penalties, Appeals Process, Innocent Spouse Rules, First Time Abatement as well as tax forms 594, 9465 and 656. This online video course is taught by Professor Arthur Reed, MBA, CPA, MST and awards 1 credit hour under the Federal Tax Category.